His parents weren’t just murdered. It was a slaughter—a rage kill like no one on the Crimes Against Children team had seen before. But they’re going to see it again. An avenging angel is meting out savage justice, and she’s far from through. A mysterious “angel” doles out vicious justice, delivering bloodied children to an agent’s doorstep in Dot Hutchison’s THE SUMMER CHILDREN. One by one, each child recounts a chilling tale where they’re forced to watch the murder of their abusive parents, who have made them suffer unimaginable cruelty. They’re safe now, the angel tells them. Agent Mercedes Ramirez knows these kids’ story all too well, she’s lived it too. But she doesn’t understand why her, why they’ve been entrusted to her care. As Mercedes and her team work to identify the killer, more parents are savagely murdered, more children covered in blood are dropped off for her to keep safe. Every child’s story dredges up her own real-life nightmares and they’re beginning to take a toll. Worse yet, the angel assassin is starting to make mistakes, changing the game altogether. 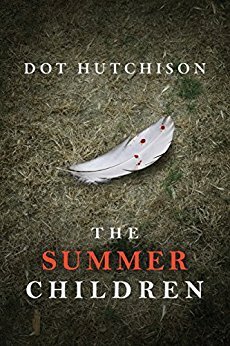 THE SUMMER CHILDREN is the third and final standalone thriller in Dot Hutchison’s Collector trilogy, and it’s as clever and addictive as it is chilling and disturbing. Hutchison holds no punches in this edgy series—it’s gruesome and dark, the crimes vividly depicted. I absolutely loved our heroine, Mercedes, who anchored this suspenseful narrative with both vulnerability and strength. Her story and her relationships helped to strike the right balance between emotional gravitas and edge-of-your seat suspense. It’s certainly a novel that’s difficult to put down, or in my case, hard to stop listening to it (on Audible). While I never finished THE ROSES OF MAY, the first book—THE BUTTERFLY GARDEN—is as fantastic as this finale. I can’t recommend these books highly enough.